Modern Slow or Cold Press juicers are perfect for all types of produce making high quality, high yields juicers that taste better and have more nutrition. Health, taste, and versatility are the traits I require from a juicer so a cold press slow juicer is the machine I choose for my kitchen. 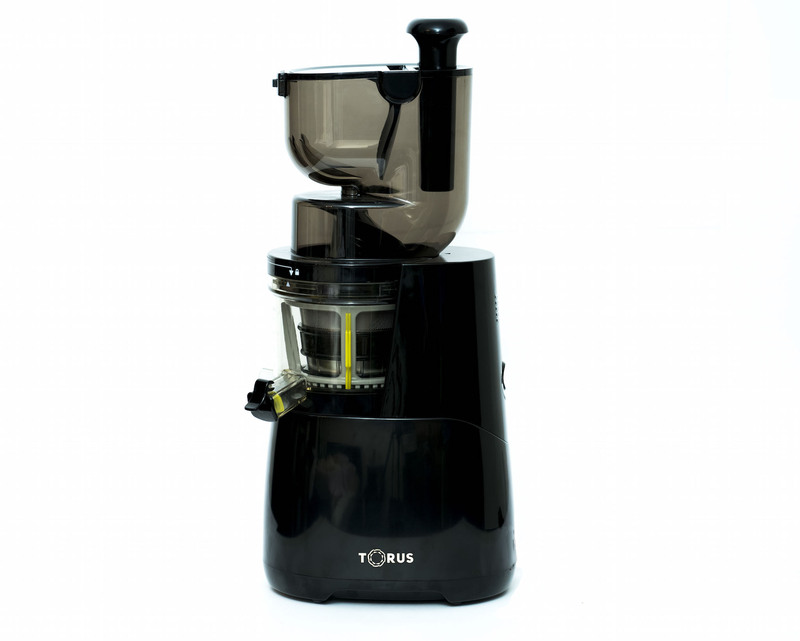 As I use an OmniBlend blender, I decided to test drive and review the new Torus Slow Juicer range of slow juicers distributed by OmniBlend Australia, just released to the Australian market. All Torus Slow Juicer machines use non-leaching BPA free plastic. Thank you OmniBlend Australia! The Torus T5500 Pro Big Mouth is the top of the line in modern slow juicing and the large dual hopper system puts this machine in high demand. A great performer, its big mouth chute – the widest on the market – fits most fruits and vegetables without cutting, saving you preparation time. The Torus T5500 is fast and powerful; its AC induction motor makes light work of anything you throw in – even hard vegetables like carrots, celery and apples go through at a decent speed. Though it takes full size fruit the T5500 maintains a small footprint. The T5500 comes with a blank plate allowing you to make nut butters, sorbets and ice creams. The machine operate at 60 RPM – slightly slower speed than the T1000 at 65 RPM – but once you get down to these speeds I don’t believe it makes that much difference. There is no temperature increase on juices produced by any Torus juicers. Both Torus slow juicer machines are competitively priced compared to equivalent models in the Australian market and I believe a bargain is to be had. 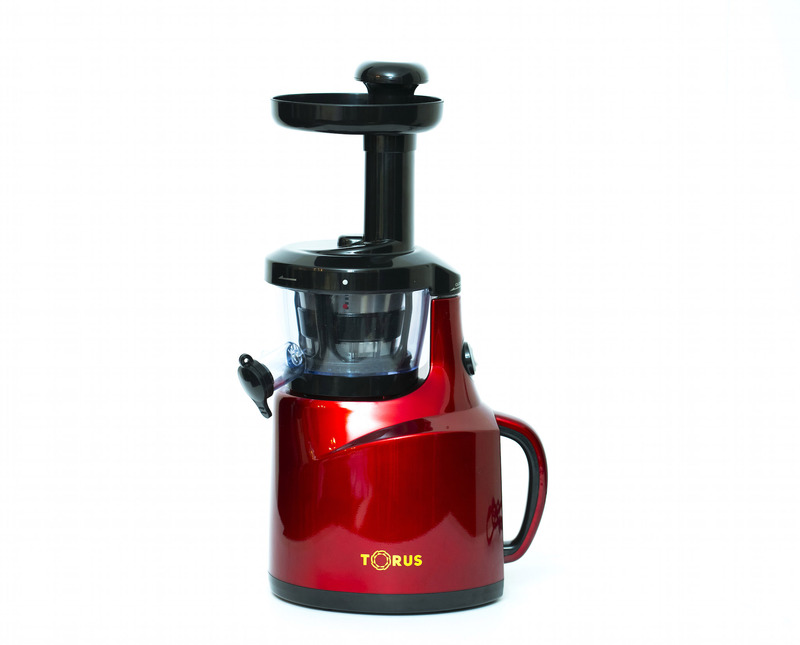 With its range of prices and colours most juice lovers can find a Torus machine to fit their budget and needs. All machines have long warranties: 3 years on the T1000 and 8 years on the T5500. OmniBlend Australia (the Torus distributor) has a reputation for looking after their customers and has been looking after me as a customer for almost two years now. Torus has delivered a cutting edge range of well built and industry leading juicers. 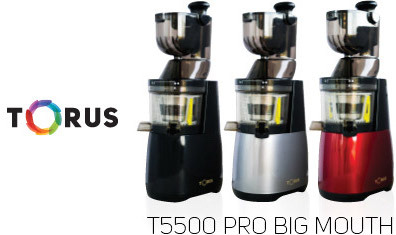 I highly recommend any one of these machines and I am so happy with my Torus T5500 Pro Big Mouth Slow Juicer.